Dale O'Banion, 95, of Horse cave passed away Friday, October 12, 2012 at Caverna Memorial Hospital. He was a Hart County native, retired farmer, a former Board Member of the Hart County Farm Bureau and Southern States CO-OP, worked many years for several tobacco warehouses in Horse Cave and a long time member and Deacon of Lonoke Baptist Church. He was preceded in death by his parents, Ethridge C. O'Banion and Mary Thompson O'Banion; a daughter, Ramona Marie O'Banion; 3 brothers, Raymond O'Banion, Dee O'Banion and Ralph O'Banion; 2 sisters, Vetra Isaacs and Geneva Logsdon; 2 grandchildren, Timmy O'Banion and Dewayne O'Banion. 5 Grandchildren: Denise Henry (Phil), Bowling Green, Laurie Hunt (Randy), Floyds Knobs, In., Jennifer Thomas (Greg), Nashville, Tn., Keith O'Banion (Connie), Horse Cave, Tammy Jeffries (Troy), Horse Cave. 6 Great-Grandchildren: Hannah Hunt, Annie Hunt, Brad Hunt, Jessica O'Banion, MaKayla Jeffries and Kyle Jeffries. 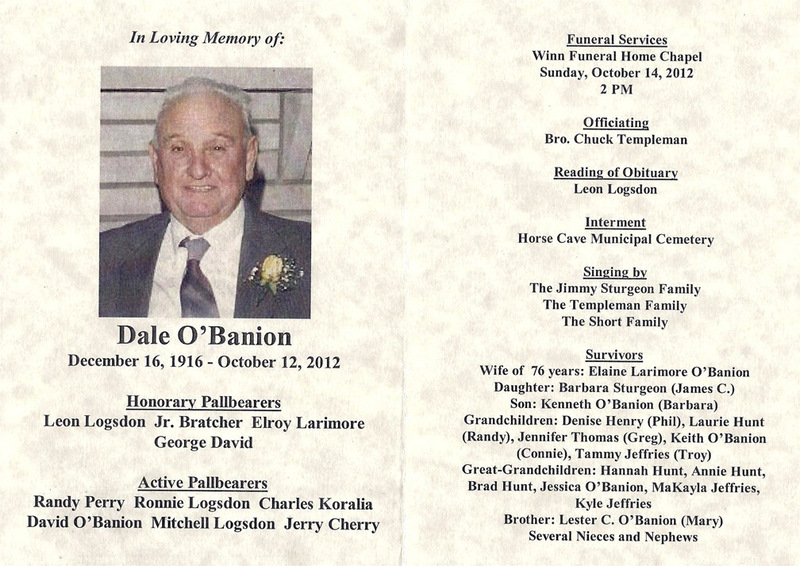 Winn Funeral Home Chapel, Sunday, October 14, 2012 at 2 PM with burial in the Horse Cave Municipal Cemetery. Winn Funeral Home Chapel, Saturday, 2PM - 9PM and after 9 AM, Sunday until service time.